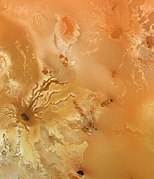 The eruption plume of the volcano Loki rises over the limb of Io. 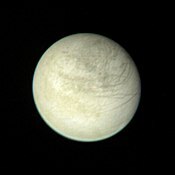 Europa's lineated but uncratered face at a distance of 2.8 million km. 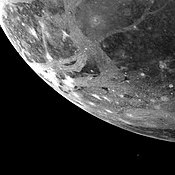 The tectonically disrupted surface of Ganymede from 253,000 km. 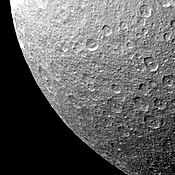 Mimas at a range of 425,000 km; the crater Herschel is at upper right. Heliocentric positions of the interstellar probes (squares) and other bodies (circles) until 2020, with launch and flyby dates. Markers denote positions on 1 January of each year, with every fifth year labelled. 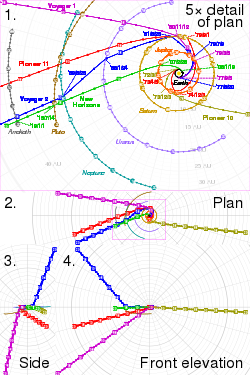 Plot 1 is perpendicular to the ecliptic, to scale; plots 2 to 4 are third-angle projections at 20% scale. In the SVG file, hover over a trajectory to highlight it. 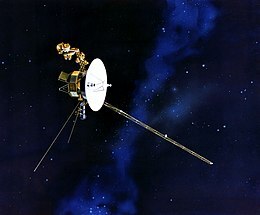 ^ Voyager 1. NSSDC Master Catalog. 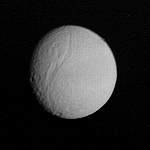 NASA/NSSDC. [August 21, 2013]. ^ Voyager 1. N2YO. [August 21, 2013]. ^ 3.0 3.1 Data From NASA's Voyager 1 Point to Interstellar Future. NASA. [2012-06-15]. ^ 4.0 4.1 Voyager - Mission Status. Jet Propulsion Laboratory. NASA. [January 2, 2018]. ^ 1960s. JPL. [August 18, 2013]. （原始内容存档于2011年5月2日）. ^ The Pioneer missions. NASA. 2007 [August 19, 2013]. ^ Mack, Pamela. Chapter 11. From engineering science to big science: The NACA and NASA Collier Trophy research project winners. History Office. ISBN 978-0-16-049640-0. ^ Landau, Elizabeth. Voyager 1 becomes first human-made object to leave solar system. CNN (CNN). October 2, 2013 [May 29, 2014]. 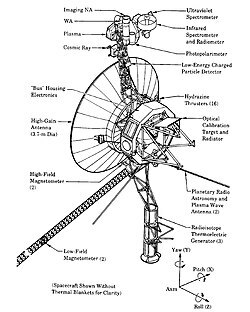 ^ 12.0 12.1 VOYAGER 1:Host Information. JPL. 1989 [April 29, 2015]. ^ High Gain Antenna. JPL. [August 18, 2013]. ^ Ludwig, Roger; Taylor, Jim. 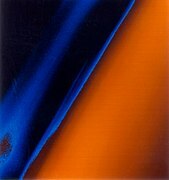 Voyager Telecommunications (PDF). DESCANSO Design and Performance Summary Series. NASA/JPL. March 2002 [September 16, 2013]. 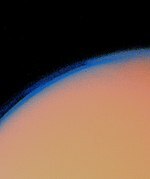 ^ NASA News Press Kit 77–136. JPL/NASA. [December 15, 2014]. 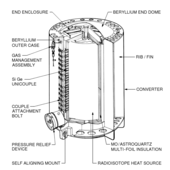 ^ 16.0 16.1 Furlong, Richard R.; Wahlquist, Earl J. U.S. space missions using radioisotope power systems (PDF). Nuclear News. 1999, 42 (4): 26–34. ^ Spacecraft Lifetime. JPL. [August 19, 2013]. ^ pds-rings. [May 23, 2015]. ^ Tomayko, James. Computers in Spaceflight: The NASA Experience. NASA. April 1987 [February 6, 2010]. ^ au.af. [May 23, 2015]. ^ airandspace. [May 23, 2015]. 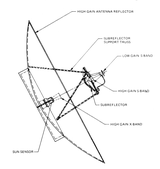 ^ Voyager 1 Narrow Angle Camera Description. NASA. [January 17, 2011]. ^ Voyager 1 Wide Angle Camera Description. NASA. [January 17, 2011]. ^ Greicius, Tony. Voyager 1 Fires Up Thrusters After 37 Years. NASA. 2017-12-01 [2017-12-13] （英语）. ^ Planetary voyage. [18 August 2013]. 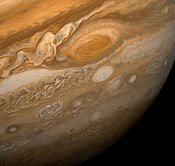 ^ Jupiter. [18 August 2013]. ^ 旅行者 1 号轨道修正推进器在 37 年后再次点火. Solidot. [2017-12-02]. 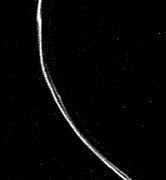 ^ Voyager Signal Spotted By Earth Radio Telescopes. NASA (NASA TV). September 5, 2013 [2015-05-20]. 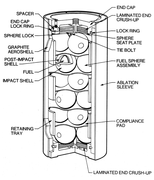 ^ Catalog Page for PIA17046. Photo Journal. NASA. [April 27, 2014]. ^ It's Official: Voyager 1 Is Now In Interstellar Space. UniverseToday. [April 27, 2014]. ^ Ghose, Tia. Voyager 1 Really Is in Interstellar Space: How NASA Knows. Space.com. TechMedia Network. September 13, 2013 [September 14, 2013]. 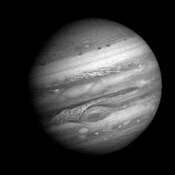 ^ 36.0 36.1 Cook, J.-R. How Do We Know When Voyager Reaches Interstellar Space?. NASA / Jet Propulsion Lab. September 12, 2013 [September 15, 2013]. ^ 37.0 37.1 Voyager – Mission – Interstellar Mission. NASA. August 9, 2010 [March 17, 2011]. ^ Future. NASA. [October 13, 2013]. 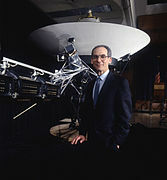 ^ New Horizons Salutes Voyager. New Horizons. August 17, 2006 [November 3, 2009]. （原始内容存档于2011年3月9日）. ^ Voyger: Spacecraft Lifetime. Jet Propulsion Laboratory. NASA. March 3, 2015 [2015-05-20]. We Are Here: The Pale Blue Dot.  A short film on The Pale Blue Dot picture taken by Voyager. Narrated by Carl Sagan.